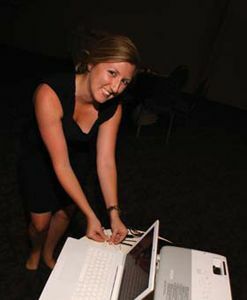 1 Christine Allman of KEH Communications sets up the Epson PowerLite 826W for the T&L 30th anniversary presentation. 2 Editorial Director Kevin Hogan with edtech specialist Kelly Kronfeld (now with OnCourse Systems). 3 T&L advisers Daniel Rezac, Meg Ormiston, Scott Floyd, and guest. 4 Chris Lehmann, principal of the Science Leadership Academy and top 100 T&L edtech leader. 5 T&L publisher Allison Knapp and VP, group publishing director Adam Goldstein. 6 T&L managing editor Christine Weiser and Kevin Hogan with top 100 T&L edtech leaders Chris Lehmann, David Thornburg, and Joyce Valenza. 7 T&L advisers Joyce Valenza, Scott Meech, Lisa Thumann, Daniel Rezac, Scott Floyd, Ben Grey, and Mike Gorman. 8 HP’s Liz Crawford and ER/Edelman’s Dolleen Casey. 9 American Education Corp.’s David Gilliland with T&L account manager Caliann Mitoulis and marketing manager Jared Stearns. 10 Contributing editors Gwen Solomon and Judy Salpeter, Allison Knapp, and former T&L publisher Jo-Ann McDevitt. 12 Judy Salpeter, former T&L editor Susan McLester, and Kevin Hogan. 13 EdRoom’s Ellen Bialo and Dell’s Kalonji Martin. 14 Adam Goldstein, Lightspeed’s Brian Thomas, and New Bay CEO Steve Palm.